I do feel like a bit of a broken record rolling out the same disclaimer before I write about seafood. I do not really like fish and I doubt that it will never feature highly on my "things to eat before I die" bucket list. 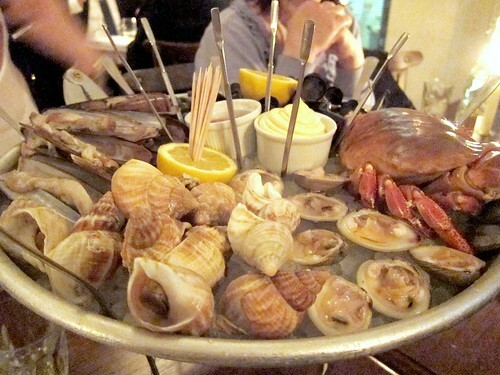 All that being said, I am partial to a bit of shellfish, squids and the like and when my sister suggested that she wanted to book Wright Brothers for our traditional family birthday meals, I was not against it and was indeed looking forward to a sumptuous seafood platter as observed on other blogs. Arriving just before seven was a little odd as the room was bare bar a couple keeping themselves to themselves. After walking all the way through to the back of the restaurant, I managed to locate a few waiters, and after a few awkward moments of just standing there, they finally came over and showed me to our table. The service definitely did improve throughout the evening, although slowly as the place filled up and reaching a crescendo when a rather important looking person in a suit turned up to ask everyone how their meals were (a real pet hate, as if I had any feedback, you would know about it, and the courtesy call just makes me feel awkward and fake). Sisters and family arrived shortly after, and it didn't take long for us to order a large seafood platter to share. Thankfully our platter comprised of clams, winkles, mussels, razor clams, whelks and a sizeable crab arrived and we were immediately appeased. Each morsel tasted fresh and light, and as a sharing dish, you can't really get more fun. Personally, I focused on the clams (which I have a soft spot for) and treated each individual one like a delicious mini oyster. The winkles were a chore but fun and the whelks were just a little bit too intimidating. Mussels were clean and sweet in flavour, and I left the others to the other morsels as I tucked into the rather excellent bread and butter. Sadly, that's where the good stuff ends as my main was very disappointing. A special of roast pollock served with morcilla, piquillo peppers and potato sounded exciting and packed full of earthy and sweet flavours of Spain but was sadly let down by a dish so bland I proceeded to douse it with my sisters fish soup and my other sisters liquor from her moules mariniere. 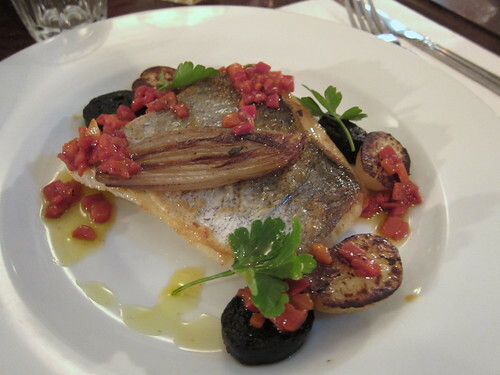 The fish itself was delicate and cooked through, but lacked any sort of crunch on the skin. The small rounds of morcilla was essentially a rather bad black pudding and didn't compare to any morcilla I have ever had before. Dry, overcooked and underwhelming. The piquillo peppers somehow packed no punch, and the whole dish lacked any seasoning what so ever. 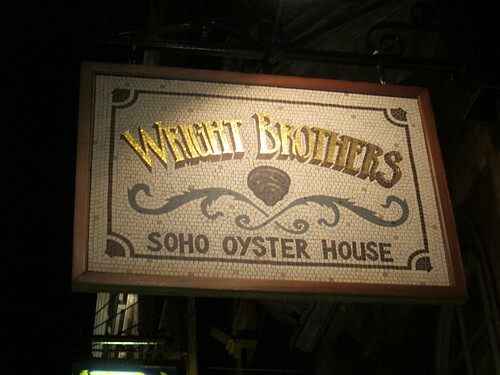 So even with my seafood prejudices, I gave it a go and found Wright Brothers lacking. I really enjoyed our self assembled seafood platter, which was fresh and a lot of fun, but the rest of the dishes were poor. I am not even just basing this on my dish, but on all the dishes we had that night. Head to Wright Brothers for their excellent seafood platter but I would give anything which requires seasoning and balance of flavours a miss. Oh dear. If the only things they do well are sourcing seafood and serving it on a platter then that's a bit of a problem. Not wishing to burst the fresh shellfish bubble at Wright Bros, but had a nasty bout of food poisoning after sharing one a few months back... shame, as it really did look and taste lovely. My friends suffered the same fate as me. @ Lizzie - A lot of a problem. If you can't do it, just don't bother! @ Catty - Word. You draw beautifully!